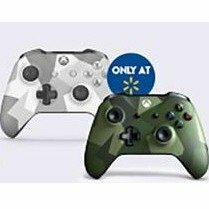 Walmart offers the Xbox Wireless Controller for $39. Features: The BEST Controller just got even better. Experience the enhanced comfort and feel of the Xbox wireless Controller, Featuring a sleek, streamlined design, textured grip, and red Finish. Enjoy Custom button mapping and up to twice the wireless range. Plug in any compatible headset with the 3.5mm stereo headset jack. And with Bluetooth technology, play your favorite games on Windows 10 PCs and tablets.